Apple has today released a new version of the iTunes 10.5 beta to developers. This edition ‘6.1’ supports one major new feature: Apple’s iTunes Match service, which will scan your iTunes library and match it with songs in Apple’s library, allowing you to download them to any iOS device directly or even stream them from your library. This service was one of several major pillars of Apple’s new iCloud product that was announced at WWDC. Once you have installed the iTunes beta, you have access to a new ‘iTunes Match’ tab that allows you to begin scanning your library for songs that match Apple’s database. 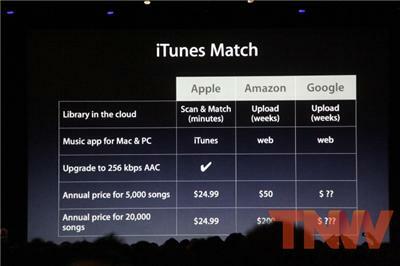 If iTunes Match finds any of your songs in their database, and they are better quality, it will ‘upgrade’ them for free. Apple does warn however, that iTunes Match has a limited amount of song formats currently and that these may be different versions from the ones that it detects in your library. 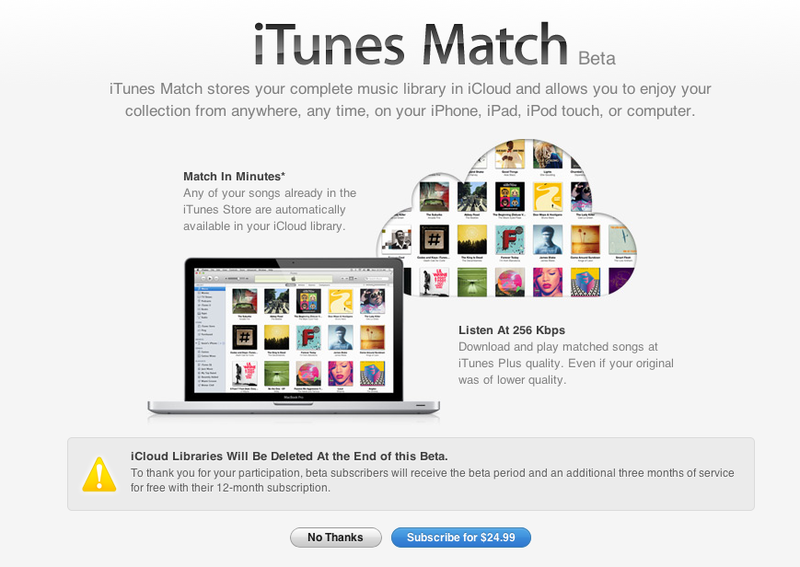 It goes without saying that this service is still in beta, so if you’re participating do not erase any of the music on your computer as the iCloud database can be deleted at any time. We’ve been playing around with iTunes Match and it turns out that the service has one distinct feature that we don’t recall being detailed at WWDC. 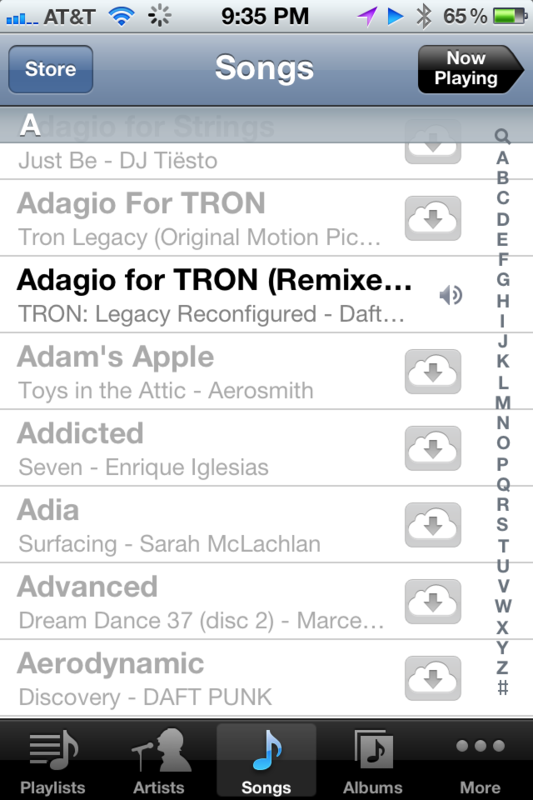 In addition to re-downloading your music from iCloud, you can also stream songs without downloading them. This effectively turns your iTunes Match library into your own personal Rdio-like service that will allow you to listen to your whole library without downloading it. Very cool. It’s hard to say why this detail wasn’t revealed or made clear earlier, but it would be easy to conjecture that licensing is the likely culprit. It is possible that the deals to allow downloading of the music were in place, but Apple had yet to ‘convince’ the labels to allow users to stream songs. When iTunes Match launches, users will be able to pay the $24.99 yearly fee to have up to 25,000 songs in the cloud that are automatically uploaded and upgraded. These songs will be available for them to download on any of up to 10 different computers and iOS devices at a time, although only 5 of those devices can be computers. iTunes Match is set to launch this fall with iOS 5. iOS 5 is the next major revision to Apple’s software for iPhone, iPod, Apple TV and iPad devices. The new OS is slated for release in the fall of this year. You can see our complete rundown of the iOS announcements at WWDC here. We’ve also got a closer look at some of the features of iOS like iMessages, Twitter, Setup and Notification Center, iCloud and alerts.